Lighthouse Interactive and Big Time Games have announced the release of their new investigative/horror adventure game, Delaware St. John: The Seacliff Tragedy. The sound of a hundred voices leads our hero to the site of a decrepit amusement park – a site closed four years earlier after a tragic accident occurred in which more than a hundred people were killed. Playing as both Delaware St. John using your psychic abilities, and his partner Kelly Bradford who relies on science and special equipment to track paranormal activity, you discover this is only the beginning of a series of dark events occurring in this condemned amusement park. Demons known as Shadow People are the evil gatekeepers, guarding the desolate park from trespassers. Armed with your psychic visions and high-tech equipment, you find yourselves trapped in the haunted amusement park. To survive the night, you must fend off these soul-stealing ghouls. 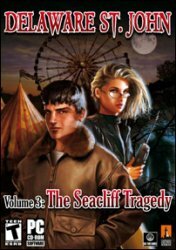 Together you must solve the mystery behind a baffling accident known as The Seacliff Tragedy and unlock its dark secrets. The game allows you to play two different characters – as psychic detective Delaware St. John or his partner Kelly Bradford. You explore stunning 3D environments as you investigate the remains of a haunted amusement park and use the VIC (Voice/Imagery Communicator) to take pictures, record sounds, and contact your assistant for clues. You’ll find a dark mystery and discover that the ghostly residents aren’t the only ones who know about what happened at the condemned park. Chilling gameplay will force you to face your deepest fears as you encounter pure evil lurking in the shadows. You must outrun and outwit the creatures if you’re to survive the night. The game will require you to solve an array of puzzles and decipher Delaware’s visions in order to defeat the evil Shadow People and solve the mystery. The Seacliff Tragedy is the third Delaware St. John game, following on the heels of The Curse of Midnight Manor , which was released in June 2005, and The Town with No Name from December 2005.